Split is a Blumhouse Productions, with Jason Blum, but this is a very different film from the Paranormal Activity films he first put out. 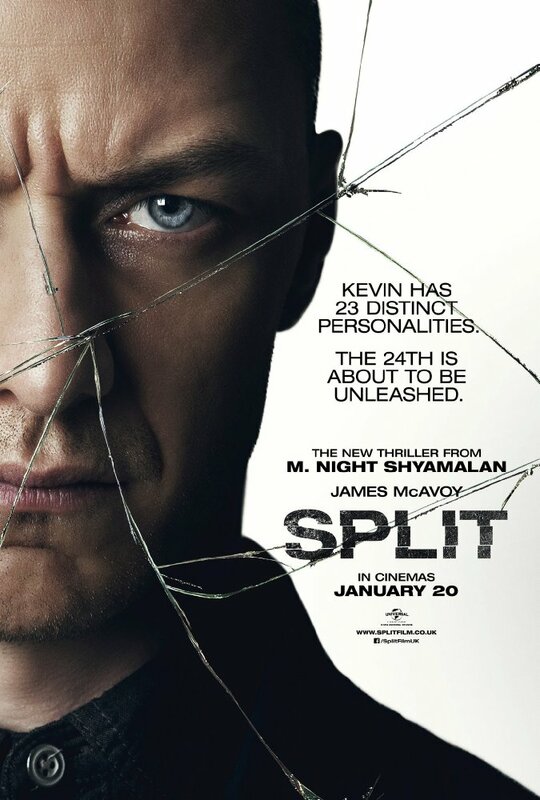 Split stars James McAvoy, Anya Taylor-Joy, Haley Lu Richardson and is written and directed by M. Night Shyamalan, who seems to be getting back in touch with his core creative self, or is getting big help from Jason Blum, et al in putting out some decent content! "Three girls are kidnapped by a man with a diagnosed 23 distinct personalities. They must try to escape before the apparent emergence of a frightful new 24th." The three kidnapped girls are a mix of society, with two accustomed to the more affluent lifestyles and one is a more street-wise, seasoned street urchin of a girl who has a track record of running away from home. And as we find out later, for good reasons. But be it as it may, when the girls get kidnapped, they have a bit more resolve than I would have given them credit for, but as time goes on with their captivity,they realize they're being held by a man with a few mental issues. Well, 26 to be exact. The girls don't totally play the victim but rather, start to figure out how to take a stand in little steps while being imprisoned by this maniac of a guy. But each stage of defiance is met with more strict imprisonment situations for the individual. Meanwhile, we follow Dennis (et al) (McAvoy) as he spends quality time with his shrink (Betty Buckley) who knows he has a number of personalities but isn't aware of exactly what he's doing with those personalities. We're also introduced to her premise about multiple personalities, where the personality can create the physical bearing of the afflicted personality, where one ID might have anemia, but the other IDs don't, and the anemia only presents itself during that ID. Which has us wondering throughout most of the movie, if one of Dennis's personalities is 'The Beast,' just what the hell happens? What is that part of him? And then there was that surprise twist or well, not so subtle hint that this set of events takes place after Shyamalan's 2000 film, Unbreakable, starring Bruce Willis. More on that in a bit. All in all, the film was not bad at all. It netted a 7.3/10 on IMDb and a 75% on Rotten Tomatoes. When do you ever see those two tallies match up? Everyone pulled their weight in the roles, with McAvoy pulling the weight of a number of characters, but it was downplayed enough to not be too much over the top. I guess he did well enough to warrent an accolade or two from this viewer, and as the film wound down, we weren't disappointed with how events evolved. But what overshadowed my watching the film was waiting for that very last scene, the one that was going to give me goose bump because it was that exciting to see and realize where this really was going. The one where Bruce Willis makes a quick and subtle appearance. And it was wonderfully satisfying. You see, I loved Unbreakable. It was a classic, reluctant hero that was not an overdone story. Sure, I already saw the news and headlines about it and I believe filming has commenced with Shyamalan's next project and is now in post-production, titled Glass. Glass brings together events of Unbreakable with events in Split, and Glass includes Bruce Willis, Samuel L. Jackson and James McAvoy. We also see Anya Taylor-Joy return from her stint in Split.